Part of the Volume on Civic Life Online: Learning How Digital Media Can Engage Youth. 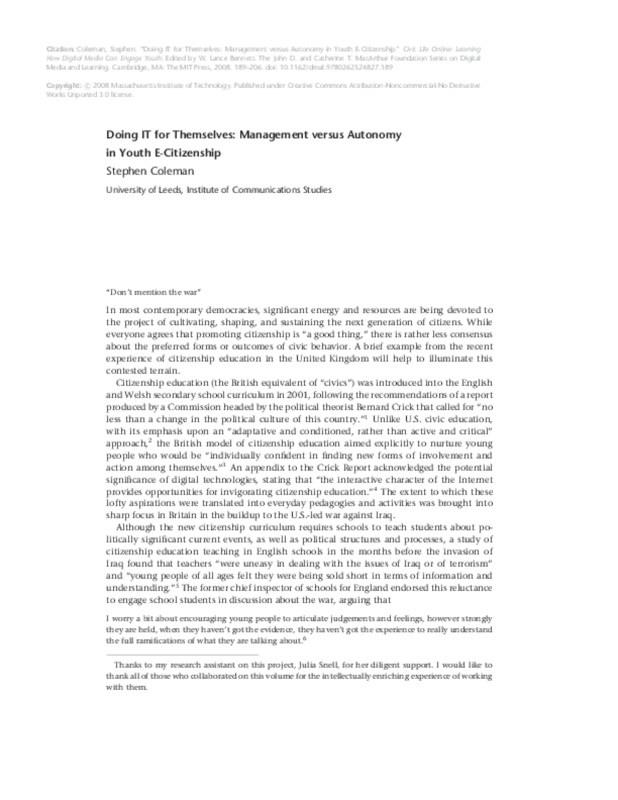 This chapter explores tensions between managed and autonomous conceptions of youth e-citizenship as manifested in six UK-based projects. Managed youth e-citizenship projects are characterized as seeking to establish "connections" between young people and institutions that have power over their lives. Regarding youth as apprentice citizens who need to learn appropriate ways of engaging with encrusted structures of governance, they seek to promote habits of civility, while at the same time encouraging young people to think of themselves as empowered social actors whose (virtual) voices deserve to be heard. In contrast, autonomous e-citizenship projects tend not to be funded by government, and express strong reservations about having relationship too close to the state. These projects are less interested in engaging with powerful institutions than in forming powerful networks of young people, engaged with one another to resist the power of institutions. Regarding youth as independent political agents, autonomous e-citizens expect less from the communicative potential of having their say; for them, empowerment entails an intimate relationship between voice and action. The chapter concludes by proposing a set of policy recommendations that might lead to a productive convergence between these two models of youth e-citizenship.